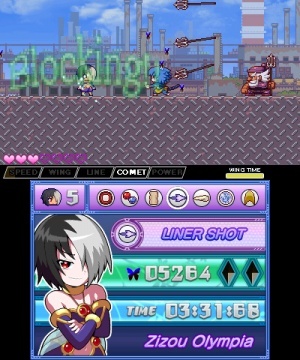 The gameplay is straightforward for any Megaman fan as you basically play through six stages of action platforming, shooting your way past many weaker enemies and at the end of each stage you'll face-off against a powerful "master" of the stage and if you beat her, you'll receive her power! Certain powers are effective against certain masters just like in the Megaman series! There are some definite tweaks to the classic Megaman formula as enemies will drop butterfly looking orbs that you can collect and use to enhance your abilities and weapons! The game also features a neat minigame that can be quite enjoyable so we won't spoil it for you! The controls are quite intuitive and very easy to learn and the 3D effects are either very weak or nonexistent, we honestly couldn't tell which was the case. 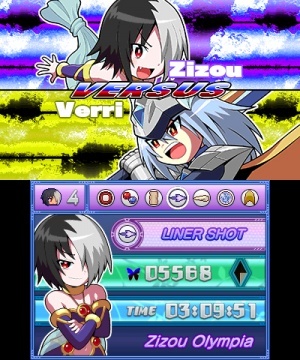 Visually the game is gorgeous, as are the adorable anime-style girls that you can play as, and face-off against a.k.a. the masters! The backgrounds in the stages and level design are also magnificent! The soundtrack is also absolutely incredible in The Legend of The Dark Witch and is possibly its strongest asset which is saying alot given the overall quality of the game! 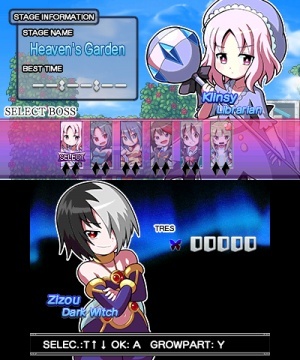 If you are a fan of cute anime girl protagonists and antagonists, as well as fantastic Megaman-style action-platforming, The Legend of The Dark Witch is quite possibly the best 3DS eShop title that fills those two checkboxes! The flawless controls, and picture-perfect audio-visual presentation make this game the perfect choice for fans of the genre and because of this we give the game a near perfect score! Booyaa! Awesome review dude, and damn there are some great waifu's in this game! Blad is my new waifu! So many waifu comments lol. Great review btw! This game is so fun! Nice review @Ichigofan!